Alternatives to Inversion - And when should you use them? There is no doubt that using an inversion table is a great way to stretch out your back and provide the body with a range of healthy benefits. 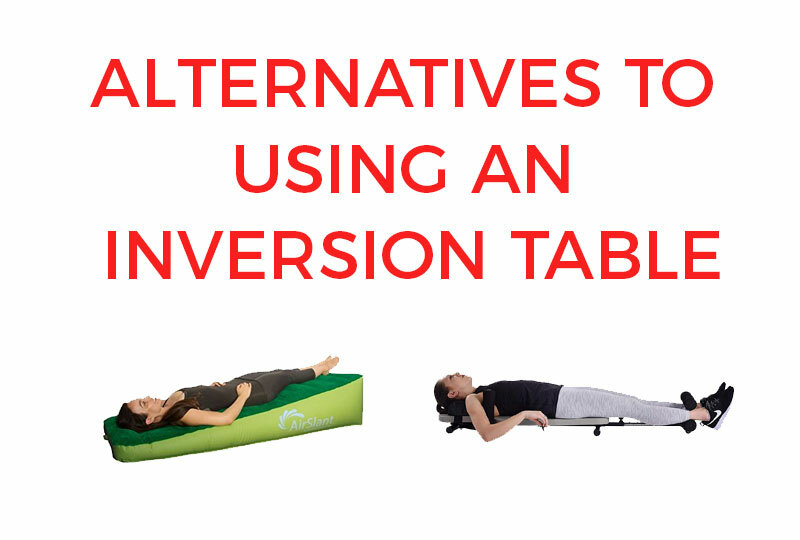 However, if you have done your research on the health pros and cons of inversion you will understand why using an inversion table is not an ideal solution for all. Most of the main issues that arise from inversion is due to hanging upside down from the table and the increase in pressure around the upper regions of the body. Due to the increased pressure in the head for example, those with visual health issues are advised not to use an inversion table at all. Those with other health issues such as heart disorders and high blood pressure are also advised to avoid inversion. For some people, the build up of pressure in the head is also one of the main reasons they simply don’t like to use an inversion table, even if they have no health issues whatsoever. Some users complain of dizziness after using an inversion table and others can be prone to headaches. I have myself experienced a light head after inversion sessions and even found my throat to feel uncomfortable while inverting. If you simply find using an inversion table uncomfortable and would like to avoid the dizzy feeling. Then the products featured below are an excellent alternative to an inversion table and will certainly remove the discomfort caused by inverting. If on the other hand, you suffer from an illness that prevents you from using an inversion table. You should still get the all clear from a doctor or physician whether these products are suitable for you. Many of the below products do reduce the need to hang upside down, however, they are still traction devices and therefore if you have been advised against inversion due to spinal issues, injury or osteoporosis they may not be a suitable alternative for you! Slant boards are a very simple device, they are basically a long board that the user lays on top of which are slanted at a fixed angle. Below you can see two of the slant boards/beds that are currently available. Unfortunately there are not a great deal of low angle slant boards currently available on the market, and therefore the two options listed appear to be the only slant boards available at the time of writing. One would expect however that more companies will soon start producing this type of product. One of the main selling points of the Gravity Pal low angle inversion table is its portability. It can easily be folded up and is fairly lightweight at around 19 lbs. Although the Gravity Pal is generally marketed as a great inversion tool to use while you are on the move, it is also a great choice for those that find inversion tables a little intense or uncomfortable. Gravity Pal claim that using this low angle inversion slant board for just 1 to 3 minutes can provide noticeable health benefits such as spinal alignment, improved circulation and faster exercise recovery. At first glance you may be wondering if such a low inversion angle could make much of a difference. However, many users of the Gravity Pal low angle inversion table are amazed at how effective the 13 degree slant is, with many stating that it is as effective as using an actual inversion table. In addition to this the buyer reviews for the low angle slant board are very positive and highlight just how effective this simple piece of kit is. You can read more about the features of the Gravity Pal low angle inversion table here on our website and also take a look at some of the buyer reviews. One thing to note is that the Gravity Pal slant board is a little on the pricey side. This may be due to the lack of competitors or due to the fact it is made in the USA from high quality materials. 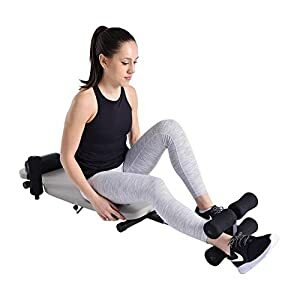 Regardless of the price however, it is a very good product overall and an excellent choice to provide your body with some satisfying decompression if you find regular inversion tables a little too much. The next best choice when it comes to inversion slant boards is the Airslant inflatable inversion slant board from Evolution Health. This is a much cheaper alternative to the Gravity Pal that can provide similar results, however, as you would probably expect (due to the noticeable difference in price) the Gravity Pal is of a higher quality overall. The Evolution Health slant board is essentially a blow up bed. It can be inflated using the built in hand pump in around 12 minutes or you can use an electric air pump which increases inflation time significantly. 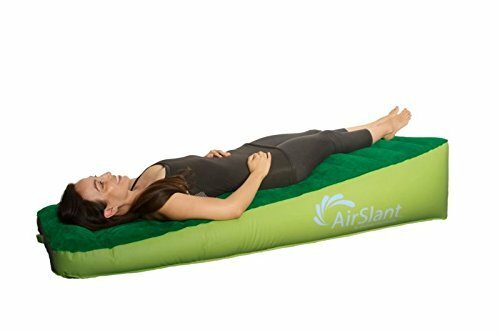 (At the time of writing you can get a free electric air pump on purchasing the Airslant air bed). 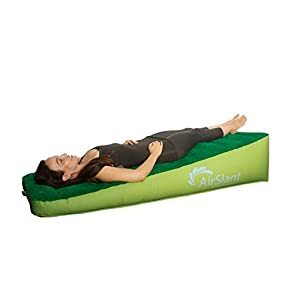 The Airslant bed can be pumped up to 14 – 17 inches at the highest end to provide a nice and gentle slope that provides a safe and comfortable way to relieve gravitational stress. The main highlight of the Evolution Health Airslant inversion bed is quite clearly the low price and the fact that there are not many similar products on the market. Much like the Gravity Pal featured above the Airslant buyer reviews are also very positive with many stating how much they love the effectiveness of the low angle of inversion. Many also love the small footprint of the Airslant inversion bed as it can be left inflated and propped up against a wall out of the way. The downside to having an inflatable inversion slant board is however that it does need to be pumped up, and it will deflate gradually over time. If you are using an electric air pump inflating the bed is a breeze, however users may find it more of a hassle if they are using the built in hand pump which takes a little longer. You can read more about the Evolution Health Airslant inversion bed here or click on the title above to read reviews at the retailers website. Slant boards are a great way of saving space. As anyone that owns an inversion table will know, inversion tables do take up a fair amount of space which is not always ideal. Due to the folding and inflatable nature of the two inversion slant boards above you can be sure that they will be great for storage and they are excellent for portability (especially when compared to large and bulky inversion tables). Slant boards are a great choice for anyone who likes to invert at a moderate angle and many find them very effective. 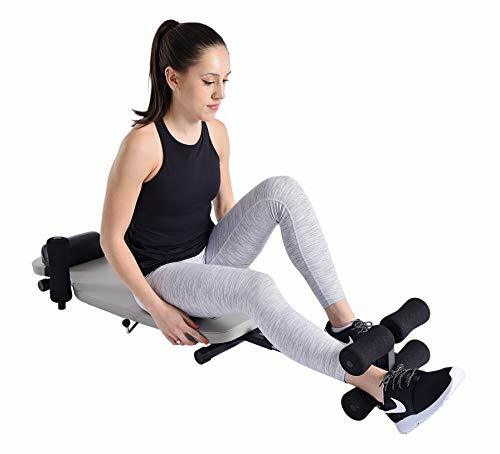 They are also less hassle to use than an inversion table as there are no safety precautions or securing of the ankles to worry about, you simply lay down and relax. The downside is that there are not yet many of these products on the market and therefore you can either choose the high end option of the Gravity Pal, or the lower end Airslant model so there are no mid priced options. In addition to this you are limited to a set angle. On an inversion table you have a lot more freedom should you wish to increase the angle of inversion. This however, does not seem to be an issue judging by the buyer reviews on both products as many seem to feel the low angular slant is fully sufficient. Overall Slant board low angle inversion tables are a great choice for those that find regular inversion too intense or feel a little unsafe using an inversion table. The back stretch bench is a great idea and one that does not require you to invert at all. 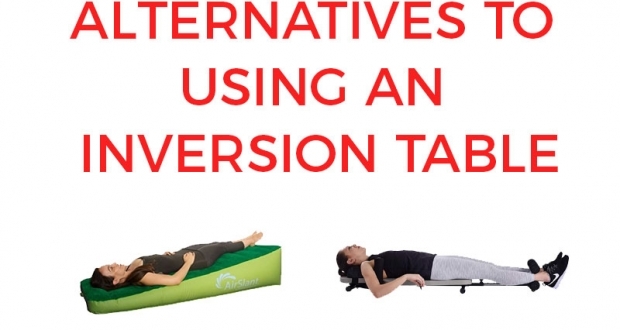 Unfortunately (like many of the items in this alternatives to inversion tables list) there are not many options available to choose from. However the one that is available on the market is popular and well rated. 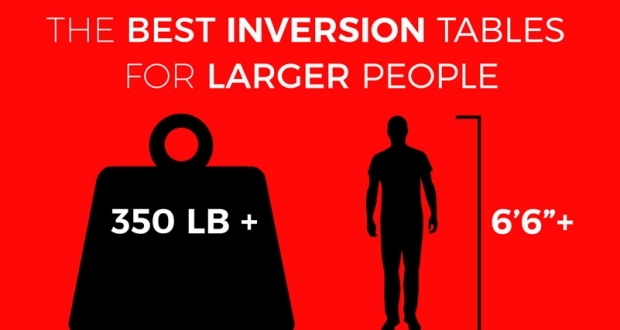 It is also priced very well in comparison to inversion tables. Designed in a similar style to a backrest on an inversion table, the Stamina Inline back stretch bench works while positioned horizontally on the floor. To use the back bench you simply secure your ankles much how you would on an inversion table and lay flat on the bench. 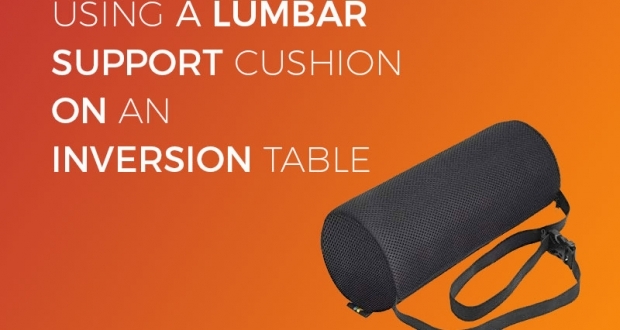 once laying on the bench the two upright foam rollers are positioned under your armpits (the upright foam rollers can also be adjusted out from the table to accommodate larger users). You place your head on the backboard and can use the optional lumbar pillow as a neck support should you wish. Once in place you use the lever at the side of the bench, moving it back and forth to lengthen the bench and compress your spine and add as much traction as you require. Using the Inline back stretch bench you can stretch out the ankles, hips, back and knees which can reduce pain and counteract the effects of sitting all day. As well as safely decompress your spine without increased pressure in the head due to being inverted. The majority of buyer reviews for Stamina Back bench are very positive. It is quite surprising how many buyers mention that this simple bit of kit has saved them a lot of money in physio bills, with many stating they no longer need physio appointments thanks to the back stretch bench. We would recommend taking a look at all of the buyer reviews just to see how good many users consider this stretch bench to be when compared to inversion tables. You can also read more about the Stamina Inline bench here on our website and see a video of it in action. While a device like this is a great way to decompress the spine, without causing the build up of pressure in the head you get on an inversion table. It does stretch the body out and therefore should not be used if you have had a knee or hip replacement. As with all products of this sort, if you have had any surgery or do suffer from any medical conditions you should consult a medical professional before making a decision to purchase. Just like the slant boards the back bench is a lot easier to store and transport in comparison to an inversion table. You can easily slide the back bench under a bed when not in use or prop it up against a wall since it doesn’t have a large base found on inversion tables. It is also a very similar price to many of the low end inversion tables on the market making it great value for money. Another great thing about the Stamina Bench is that you are not inverting at all. Therefore if you find inversion a little daunting or despise the lightheaded feeling from pressure building up in your head, this is an ideal alternative to a regular inversion table that is suitable for many. The only real downside to the Stamina Inline back bench is that if you are unable to use an inversion table due to skeletal issues, bone problems or surgery, it is unlikely you will get the all clear to use this device due to the traction aspect of the product. These inexpensive items can be worn underneath your clothing and they are a great way to realign your spine and help you maintain good posture. The posture corrector is strapped around your shoulders and opens up your chest while pulling the shoulders back. Although back supports do not aid you with spinal decompression, wearing one on a regular basis will serve as a reminder as to how you should be standing when upright. They also reduce slouching, strengthen muscles and relieve back pain. There are absolutely loads of these posture correctors available on the market, however do be wary as some are better than others. For example, one that I tested did not hold its shape at all and was fairly uncomfortable to wear for long periods of time. Below are a few choices of some of the best rated on the market. The Selbite posture corrector is one of the best rated on the market and retails at a pretty low price when compared to similar posture correctors. The strap system on the Selbite back posture corrector is easy to use and the Selbite corrector also has some detachable pads which can be positioned in the armpit region to prevent uncomfortable pinching. Manufacturers of posture correctors claim that their products can help to gently realign the vertebrae and ease upper back and neck pain. It is also claimed to help maintain an restore a healthier posture while reducing slouching. I must admit when I first read about posture correctors I wasn’t completely convinced, however after reading other buyer reviews it was very eye opening how good many users found them to be. In addition to this they are very low in price. The Selbite posture corrector is one of the best on the market due to its comfortable design and because of how effective it is considered to be by many. It has numerous very positive reviews and many note how effective they have found the back corrector to be. It is also complimented on how easy it is to use and what great value for money it is. Other posture correctors you may come across feature a more supportive lumbar wrap around like this DIANMEI back support. Generally speaking these sort of posture correctors tends to be less well rated than the style above. However, if you look around you can find some products that everyone seems to agree are a good choice such as this DIANMEI support. 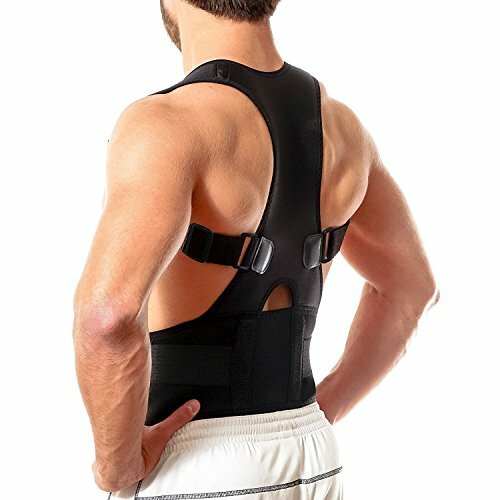 Essentially this type of posture corrector does everything the style of posture corrector above does, however it adds more support to the lumbar area and the more central area of the back. The reviews for this back support are also very positive overall with many stating that it is very comforable and a very good choice which has helped greatly with their back pain and posture issues. Posture corrector straps are a very cheap way of easing back pain and helping you to improve posture. They are also a great product to choose if you are sat at a desk all day or if you are prone to slouching. While it is true they are not going to be as effective as some of the other items listed here as an alternative to inversion. They are a strep in the right direction to combating back pain and poor posture habits. Posture correctors are also not useful if you are in need of a product for spinal decompression. Some posture correctors are more comfortable than others so make sure you read the buyer reviews to ensure you are choosing one that can be worn all day without discomfort creeping in. It is also worth checking in the buyer reviews to see what users say about using the posture corrector under their clothes, as some are more discreet than others. By all accounts using a stretch trainer is a great way to increase flex ability and help with stretching out the body on a daily basis. 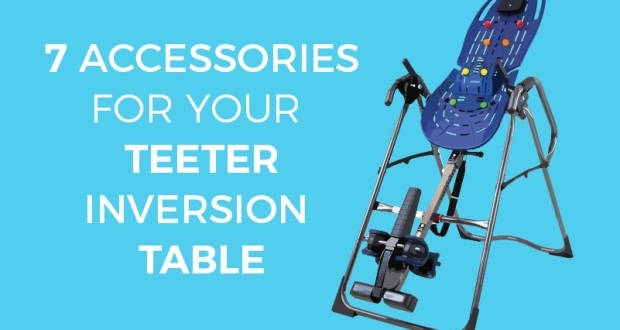 If for any reason you are unable to use use an inversion table or are fearful of inverting, using a stretch trainer may be useful for you. Unfortunately they are a little on the expensive side and the model below retails at around the same price of a high end inversion table. 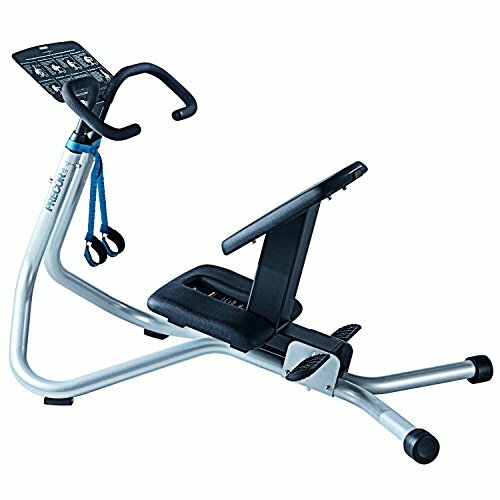 The Precor 240i Stretch Trainer came to my attention after reading someone had been recommended it based on the fact it was better than using an inversion table. And as you can read in the buyer reviews many are very impressed with this stretching device especially when used to increase flexibility and help with lower back problems. Many users have decided to purchase the Precor 240i after using it in their local gym or chiropractor. The Precor 240i StretchTrainer is lightweight at 60 lbs and leaves a fairly small footprint of 52 x 28 x 36″ (L x W x H). It is not only a good device for helping stretch your lower and upper back but can also aid in stretching out the hips, legs and shoulders. At the front of the stretching device there is an instructions board which allows you to easily see all of the possible stretches. One thing to point out is that although many state that the stretch trainer is great for their lower back, it isn’t going to be as effective as an inversion table for spinal decompression. It is also going to require a fair bit of effort and motivation from the user when compared to inversion tables, slant boards and other items on this list that provide a more passive solution to help back issues. Using a stretch trainer is a good way of stretching out the body without having to invert, however if you are looking for a piece of equipment that decompresses your spine a stretch trainer may not be the best option. There is no question that the 240i Stretch Trainer is a great piece of kit when it comes to giving the whole body an effective stretch, however it is going to suit some users more than others. As we have already mentioned using an inversion table, the slant boards or the back stretch bench above is a fairly passive solution to help with stretching out the back. Using these examples there is very little effort needed from the participant, whereas using the StretchTrainer you do need to actively push and pull yourself into position which may make it more difficult to use for some. Overall using the 240i stretching trainer provides a good body stretch and can work wonders for the lower back as you can read in the buyer reviews. Unfortunately it is overpriced in most peoples opinion.